February 29, 2016 -- The GPU market and the PC market in general, seems to have found its new normal. The Gaming PC segment, where higher-end GPUs are used, was once again the bright spot in the overall PC market for the quarter. The GPU market is rebounding and outperforming the PC market, which is stabilizing. Graphics processors, stand-alone discrete devices, and embedded processor-based GPUs are ubiquitous and essential components in all systems and device today from handheld mobile devices, PCs, and workstations, to TVs, servers, vehicle systems, signage, game consoles, medical equipment, and wearables. New technologies and semiconductor manufacturing processes are taking advantage of the ability of GPU power to scale. The GPU drives the screen of every device we encounter—it is the human-machine interface. The fourth quarter is typically flat to up in the seasonality cycles of the past. For 2015, the 4th quarter saw a 2.4% increase from last quarter, and was above the ten-year average of -3.4%. AMD’s overall unit shipments increased 5.16% quarter-to-quarter, Intel’s total shipments increased 0.73% from last quarter, and Nvidia’s increased 8.41%. The attach rate of GPUs (includes integrated and discrete GPUs) to PCs for the quarter was 139% which was up 0.59% from last quarter. Discrete GPUs were in 31.28% of PCs, which is up 1.34%. The overall PC market increased 2.01% quarter-to-quarter, and decreased -10.27% year-to-year. Desktop graphics add-in boards (AIBs) that use discrete GPUs decreased -4.87% from last quarter. Seasonally, Q4 tends to be a little higher the previous quarter. In 2008, there was a sharp decline, which was an aberration caused in line with the massive market decline of that period. The market seems to have settled back into its rhythmic seasonal cycle. Although neither AMD nor Nvidia introduced new GPUs in the second half in 2015, the chips they did introduce in Q1 and Q2 2015 were solid performers. That, combined with the introduction of a half dozen really terrific, and processor-intensive games in the second half of 2014 fed a buying frenzy that drove the GPU sales in desktop add-in boards (AIBs) and the new gaming notebook sales in Q4. Most of the PC vendors are guiding cautiously for Q1’16. That is consistent with the shipments we have seen in Q4’15 and also with seasonal trends. AMD’s shipments of desktop heterogeneous GPU/CPUs, i.e., APUs, for desktops decreased 4.3% from the previous quarter, AMD’s shipments were up 30.3% in notebooks. Desktop discrete GPUs increased 6.69% from last quarter, and notebook discrete shipments decreased 1.3%. AMD’s total PC graphics shipments increased 5.2% from the previous quarter. Intel’s desktop processor embedded graphics (EPGs) shipments increased from last quarter by 6.1%, and notebook processors decreased by -1.7% increased 0.7% from last quarter. Nvidia’s desktop discrete GPU shipments were down -7.56% from last quarter; and the company’s notebook discrete GPU shipments increased 34.2% increased 8.4% from last quarter. Total discrete GPU (desktop and notebook) shipments increased 6.57% from the last quarter and decreased -7.01% from last year. Sales of discrete GPUs fluctuate due to a variety of factors (timing, memory pricing, etc. ), new product introductions, and the influence of integrated graphics. Overall, the CAGR from 2014 to 2017 is now -4%. Graphics chips (GPUs) and chips with graphics (IGPs, APUs, and EPGs) GPUs shipments are a leading indicator for the PC market. At least one and often two GPUs are present in every PC shipped. It can take the form of a discrete chip, a GPU integrated in the chipset or embedded in the CPU. 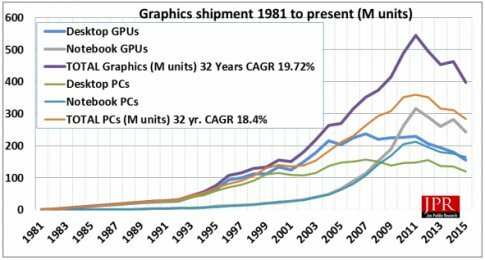 The average has grown from 1.2 GPUs per PC in 2001 to 1.39 GPUs per PC. This detailed 50-page report will provide you with all the data, analysis and insight you need to clearly understand where this technology is today and where it's headed. Our findings include discrete and integrated graphics (CPU and chipset) for Desktops, Notebooks (and Netbooks), and PC-based commercial (i.e., POS) and industrial/scientific and embedded. This report does not include the x86 game consoles, handhelds (i.e., mobile phones), x86 Servers or ARM-based Tablets (i.e. iPad and Android-based Tablets), or ARM-based Servers. It does include x86-based tablets, Chromebooks, and embedded systems. Click here to learn more about this major report, or to download it now. Or, for more information call 415/435-9368 or visit the Jon Peddie Research website at www.jonpeddie.com.